Must-do winter activities in the Capital Region? I moved to Albany in September and am looking for some suggestions of must-do winter activities in the capital region (art, cultural events, outdoor activities, etc). Very broad ask, I know, but I don't even know what the options are! Second: You might be surprised by how much there is to do during the winter here, especially if you're willing to layer up and head outside. 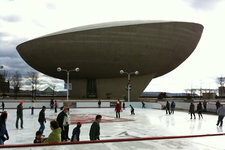 We'll start with one suggestion: You should go ice skating at the Empire State Plaza (tentative opening date this year is November 29). Sure, it gets kind of crowded, but it's fun to be outside in a public space during the winter with a bunch of other people also having fun. And if you can swing by after work, it's a nice end to the workday -- somehow the stress of all those TPS reports starts to fade after a few turns on the ice. That's just one suggestion. There's a bunch of other stuff. So, got a suggestion for Mik? Please share! Cross country skiing, either at Garnet Hill Lodge in North River (www.garnet-hill.com/) or LapLand Lake in Benson (www.laplandlake.com/). Skating on the Plaza, or in Washington park if the pond has frozen well. Skiing at Gore or Jiminy Peak. Going to the Nutcracker or the Albany symphony's "Magic of Christmas show"
Welcome to the Capital District. One of the first things to learn about winters here is that it's usually far easier to find parking places in Saratoga Springs in the winter than in the summer. - Feb. 1st - Saratoga Chowderfest - a great way to familiarize yourself with downtown Saratoga on foot while sampling many great chowders. - Feb. 14th thru 16th (Presidents Day weekend) - if you like to dance and/or listen to live bands, you'll love the Dance Flurry Festival - three days featuring all styles of participatory dancing with live bands at multiple venues - with or without a date. - any weekend and some weekdays - if you like folk, blues, jazz, visit Caffe Lena, the oldest continually operating folk coffeehouse in the US. Might want to look into the "Polar Express." train. I agree that Garnet Hill and Lapland Lake are great for x-country skiing, but if you're looking to go locally, check out Capital Hills Golf Course off New Scotland Avenue. Challenging, beautiful and FREE! Two Victorian Strolls/Street Walks are neat. There's one in Troy and one in Saratoga Springs. Yeah, the polar express that goes up to the Gore is great. You're already in the right space - any great weekend event (or even week event) gets posted on this website.. I often spend a lot of time planning weekends year round based on suggestions here. Also, wine and dine for the arts is something you just shouldn't miss. Just stick close to this blog and you'll never get bored. Otherwise if you're not into winter sports, I find it's a great time to visit places like The Spectrum and catch up on movies while it's cold outside. Must try curling at Albany Curling Club off Schoolhouse Rd in McKownville, Albany. We are holding an Open House in February where you can go on the ice, get basic instruction and try curling. @fuddley: You can eat INSIDE at Gus's? It looks so tiny! Where do they have seating... or do you have to sit on the cash registers? @Mik: Welcome to Albany! I hate winter so very much, but I get through with some uniquely Albany pastimes: going to roller derby (www.albanyallstars.com), Monday night movies at the Palace Theater (palacealbany.com), and weekend trips to the NYS Museum and the Albany Institute of History and Art. Also, AOA's week ahead roundups are key for knowing when and where all of the fun stuff is happening. Snowshoeing. If you have your own, go around Peebles Island and visit the deer family that lives there. If you donâ€™t have a pair, you can rent some at Thacher Parkâ€™s Nature Center for very cheap and shoe around the park. Also, the Troy or Hudson Victorian stroll. Snowshoeing! And hike to one of the High Peaks in the Adirondacks. I'd recommend Cascade mountain or Noonmark to start. You'll get some beautiful views of the snowy mountains. I'll add Frear Park in Troy as an epic place to go snowshoeing and sledding. Climb the Fire Tower on Fire Tower Rd in Grafton, slowly, for great views of the Berkshires in winter. While out there, visit the Grafton Peace Pagoda with freshly fallen snow, take a hike around the Grafton Lakes State Park and maybe visit the Berkshire Bird Sanctuary. Go polar bear swimming in Lake George- there are a couple opportunities including New Years Day. And there's always weekend trips to Stowe, NYC, and Ottawa, which has an awesome winter festival in February. Cooperstown also has a fun winter fest that month and another pretty epic three tiered hill along Glimmerglass Lake. Oh, and the NYS Museum's Chocolate Festival is coming up on Dec. 8, which incidentally is the same day as the Troy Victorian Stroll and Capital Tree Lighting. Snowshoe or ski close to home: Thatcher, Pine Bush or Huyck Preserve! Hockey is pretty popular with great college team RPI and Union professional team in Albany and Glen Falls. If your looking to travel a little check out City of Hudson Winter Walk on Dec. 7th it really is gaining in popularity attracting close to 20,000 people. Then obviously you have the Victorian Stroll in Troy and Saratoga Springs. Another fun activity is snowmobiling in the adirondacks check out White Lake Snow Tours. Welcome and I think you will find there's a lot to do good luck. Thank you all! I'm very excited for the winter here, especially on a beautiful day like today!